Abacus / Epsilon is running this banner ad above an article about layoffs at Oriental Trading Company on the Multichannel Merchant website. When you receive a catalog in the mail from a company you have never purchased from, a catalog sourced by a statistician at Abacus, do you feel like you are having a 1:1 conversation with that brand? Good gravy. 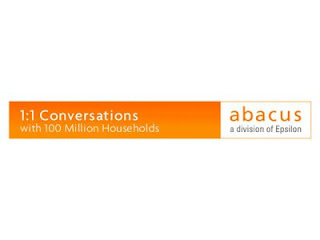 Not the fault of Abacus, necessarily --- in theory, they would make it possible for somebody to have a 1-to-1 conversation. A Google search for 1-to-1 marketing yielded more than 1.2 million results. When reading some of the articles, it is obvious that 1-to-1 marketing is initiated by a vendor community trying to sell technology to the marketer. We don't read much about the customer craving 1-to-1 marketing, do we (though we read plenty about customers wanting a brand to behave in an authentic and fair manner)? When is the last time you read text from a customer on a social media site telling the world about how they loved their 1-to-1 relationship with a catalog or online marketing brand, communicating how they loved the way they influence how a catalog or e-mail message is merchandised? 1-to-1 marketing is a myth. We simply don't have the data needed to be effective marketers. And when we have enough data, we're challenged by our ability to execute. For instance, assume you have a brilliant trigger-based e-mail marketing and catalog marketing program. You have a customer who buys both mens merchandise and womens merchandise in their order. Do you trigger mens merchandise in an e-mail? Womens merchandise? Something else? How could you possibly predict what the customer wants or needs? And you're not really executing 1-to-1 marketing, because it is unlikely you will ever let the customer have a say in your contact strategy, right? If we step back from failed concepts like 1-to-1 marketing and CRM, and simply focus on being really efficient with marketing dollars, then we have endless opportunities. There's a bunch of profitability to be had marketing to folks who have not purchased in the past year --- catalogers over-mail these customers, while online marketers under-contact these folks --- if you haven't purchased from Zappos in a year, how are they going to reach out to you in a meaningful way? We simply cannot have 1-to-1 marketing conversations with customers when we force everybody to get the same catalog, or one of five versions of an e-mail marketing message, or when we don't give the customer any say in the contact strategy. Let's be honest with ourselves. Let's focus on being as efficient as possible with our marketing dollars, a fair and noble objective.